Evalyn Walsh McLean was the only daughter of multimillionaire Thomas F. Walsh and Carrie Bell Reed. Evalyn’s husband, Edward Beale McLean, owned The Washington Post after the death of his father, Post publisher John R. McLean. The McLeans lived in splendor at the Friendship Estate with their children, Vinson, Edward, John, and Emily (“Evalyn”) on 75 acres. Friendship was demolished in 1942 for McLean Gardens. 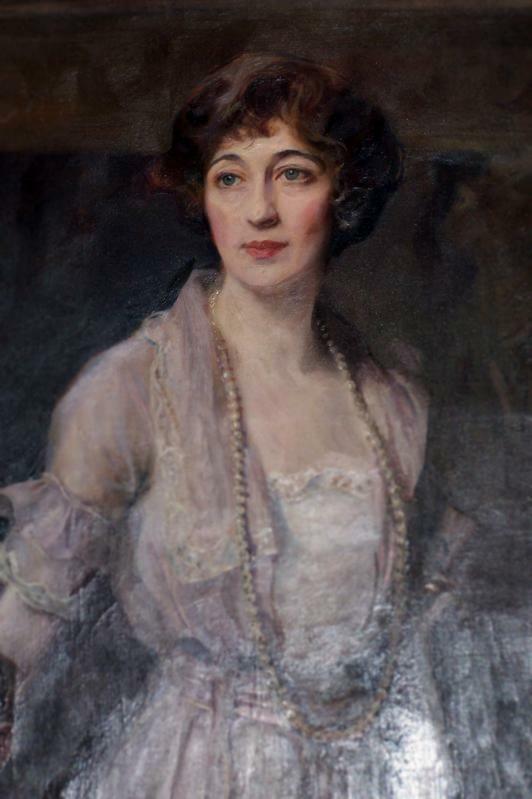 Evalyn moved easily in Washington’s elite social circles, but was best known for wearing the fabulous 45.52-carat Hope Diamond as seen above in her portrait. The McLeans purchased the world’s largest blue diamond in 1911 from Pierre Cartier of Paris. 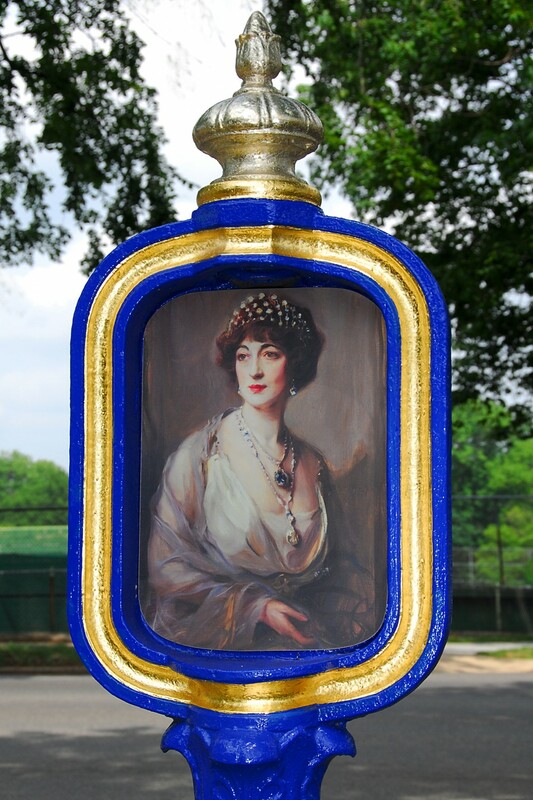 Wagging tongues and the Hope Diamond’s supposed curse did not prevent Evalyn from wearing it everywhere, including to the White House and to her favorite charity events. She actually lost it a few times — once by putting it on Mike, her Great Dane, and another time by allowing her granddaughter, daughter of Senator Robert R. Reynolds (D-NC), to teethe on it. According to the Smithsonian Institution — where the gem is displayed — there is no truth to the curse. But the tale persists, and perhaps that is why millions from all over the world come to see it. In the end, the Hope Diamond brought good luck to the Smithsonian. 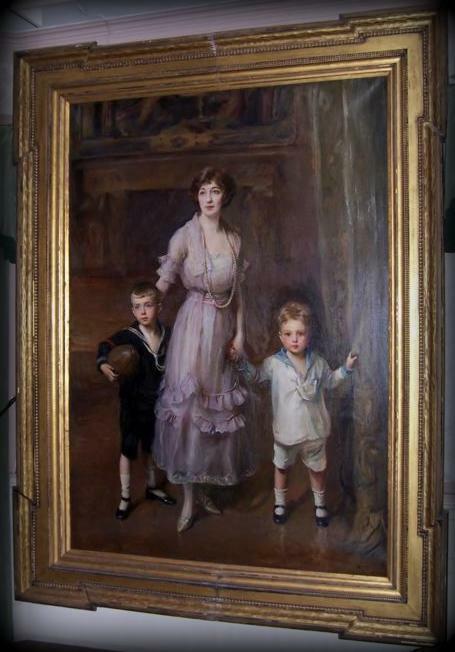 This oil portrait of Evalyn Walsh McLean with her two sons was painted by Philip Alexius de László at the Friendship Estate. It is located in Ouray, CO at the Ouray County Museum, which is near the Camp Bird Mine where Thomas F. Walsh – Evalyn’s father – made his fortune by striking gold.